The job of natural resources conservation officer has always required courage and sacrifice. One night in 1949, Officer Frank Floyd made the ultimate sacrifice in the line of duty. The humidity wasn't too bad, but the heat still radiating from a ninety-five degree day pressed upon the two game wardens walking the woods of Cherokee Plantation that night. 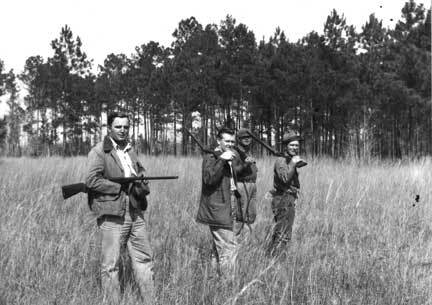 At the express request of A.A. Richardson, director of the then-state Wildlife Resources Department, officers Frank Floyd and Thomas Goethe, Floyd's nephew, had traveled from their home base in Jasper County to lend a hand at this Colleton County property. Seems there'd been an ongoing problem with night hunting on the plantation, and experienced agency reinforcements would be a real help in rounding up the perpetrators. Accompanied by William Garvin, the plantation superintendent, the two officers had been patrolling the 11,000-acre estate by car, watching and listening for poachers, but now they were parked and on their feet because they'd spotted a waiting pickup truck with lights on. It was 11:15 p.m. on July 25, 1949, and nobody had any business being there at that hour. Quietly drawing near to the trespassing vehicle, all senses heightened in the dim light, Floyd, Goethe and Garvin halted in a thick stand of pines and waited for a move from whoever had made it his business to be there. Goethe and Garvin's eyewitness accounts filled in the details of what happened next. Noiselessly, one of the truck's doors swung open, and a man wearing a headlamp and carrying a double-barreled shotgun emerged and headed into the woods. No doubt now about the trespassers' intentions - not that Floyd and Goethe had ever had any. The men took off after the night hunter. Out of the darkness, Floyd's voice shouted a challenge: "I am a state game warden! Drop that gun!" They proved to be the last words of a courageous wildlife officer, a stalwart in the field. In response to Floyd's command, the pickup truck took off, and the intruder turned to face the two game wardens. Raising his shotgun, he aimed at Frank Floyd, who grabbed for the weapon. But Floyd stumbled, losing his advantage. It was all the man needed. He let loose with one barrel and filled the left side of Floyd's chest with buckshot, next turning to Goethe with the second barrel ready to go. Goethe dropped to his knees, drew his pistol and returned fire with three or four shots, whereupon the night hunter's headlamp went out and its owner fled into the woods. Goethe cried out after him, "Come out! You've killed a man!" But no answer came back. Paying no further heed to the poacher, Goethe turned in haste to his partner. In great distress but with clarity of mind, he sought immediate help for his uncle, as well as backup for tracking Floyd's murderer. He and Garvin got Floyd into their car and sped him to Colleton County Hospital, where any hope they had of being wrong about his condition was dashed. Floyd, at only forty years of age, was pronounced dead on arrival. Too late for Floyd, but not too late to catch his killer; Goethe saw to that. Acting on Goethe's report, the county sheriff called the state police for some bloodhounds. Aided by the hounds, authorities searching the woods found the night hunter, Walter Smoak, of Sanders, tangled up in a barbed-wire fence near the scene of the shooting. One of Goethe's pistol shots had hit true; Smoak had a gunshot wound to the head, and searchers weren't sure he was going to make it. He was arrested for the murder of Officer Floyd, spent some time in the hospital under guard, and was later tried and convicted of Floyd's murder. Smoak's accomplices were also apprehended. In the minds of most South Carolinians, Smoak's sentencing to life imprisonment marked the end of this well-publicized tragedy, but for one young girl the tale was but partly told. Frank Floyd's daughter, 19-year-old Frankie Floyd (now Frankie Tokus), had just graduated from Coker College and was home for the summer the evening her father was killed. "My mother, Hortense Floyd, used to get anonymous threatening phone calls all the time - 'Your husband's dead; he's not coming home tonight,' " says Tokus. "These calls happened sometimes twice a month. Although we didn't get a warning call from Smoak, we did find out later he had made his intentions clear to others. 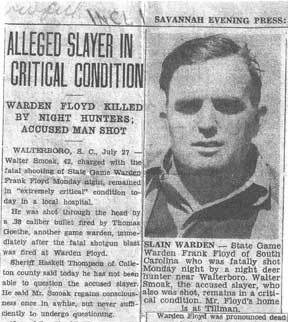 The day he did the murder, while drinking, Smoak bragged around Walterboro, 'I'm going night hunting tonight, and the first game warden I see, he's dead.' My father was the first, and Smoak got him." Frankie Tokus holds an even more poignant personal memory from that time that the press never got hold of: "The night before my father left to go to Colleton County, he picked me up from work, and on the way home we had a serious discussion about my future. He asked me to promise him certain things, which I did. Then, he pulled out a two-dollar bill and said, 'I've been saving this for you, and I want you to have it because I may never see you again.' He had never said anything like that to me before, and I've never forgotten it. I think God had told him something." Hortense and young Frankie Floyd coped in the days following Floyd's death through faith in God and the support of family and friends. While those hard days have never left her thoughts, Frankie Tokus has other, happier, memories of her father that have sustained her through the years. Tall and big-boned, Frank Floyd passed on his height to his daughter, along with his fondness for the outdoors. Tokus recalls well her early growing-up years when her father worked for Tom Yawkey on what is now the Tom Yawkey Wildlife Center Heritage Preserve. 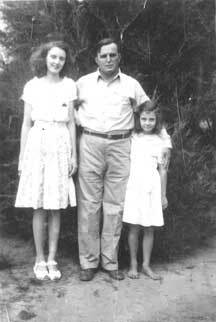 "My dad taught me to hunt and fish," she says, "and I went hunting and fishing with him a lot in the river swamp. When he baited the traps for Mr. Yawkey on his visits to South Carolina, I used to help him. We had to jump out in the water up to the waist." Floyd was an accomplished hunter and outdoorsman, and he used his woodsman's skills to support his young family and supplement his modest state salary. Deer and fish were common on the Floyd dinner table, says Tokus, and the wildcats and raccoons her dad hunted for the lucrative Savannah market brought in enough cash to buy the family a used Model T Ford. Although Frank Floyd's legacy has lingered in the memories of his closest relatives, for six decades it was forgotten elsewhere. No longer. Seeking to honor its own who have lost their lives in the line of duty, the S.C. Department of Natural Resources did the necessary detective work to uncover Floyd's story and has added it to the chronicles of nine other already-known fallen DNR officers. DNR Staff Sergeant Rick Dye, who spearheaded this research for the agency, explains how these men will be recognized. "We plan to have twelve-by-eight-inch granite markers made with our badge inscribed on them," says Dye, "because none of these gravesites have anything indicating they were officers. The markers will note the dates they were killed and will state they were killed in the line of duty. When we place the markers, we plan to have an honor guard and a little memorial service at each officer's gravesite, and we plan to invite the families." It's quite peaceful where Frank Floyd lies buried next to his wife. 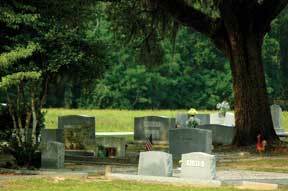 A dirt road winds up to his resting place - an open knoll in the family cemetery just outside Tillman. Frankie Tokus's best childhood friend, her cousin Virginia Floyd Wells, has lived in the neighborhood most of her life and walks to the cemetery frequently. Wells, too, remembers vividly the trauma of the night Frank Floyd was killed but finds the family cemetery a healing place. "Nearly all the Floyds are buried there," says Wells. "Frank's grave is near a big old oak. Camellias and azaleas are all around, and Frankie - she lives in New England now - has the family put flowers on her parents' graves every Easter. The old Floyd homeplace, still lived in by a Floyd, and Frank's old home are close by." You can see a long way from the family cemetery. Farmland and pine woods surround the grassy knoll, a peaceful spot for a man's last resting place. And Frank Floyd has earned his rest. 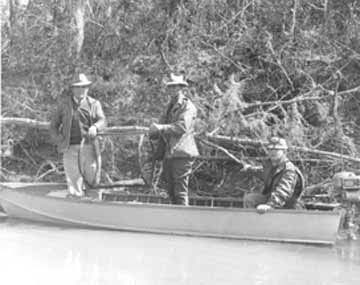 Since the first South Carolina game wardens were appointed in 1905, ten officers are known to have lost their lives in the line of duty. The names of Frank Floyd and other state conservation officers killed in the line of duty are inscribed on the walls of the South Carolina Law Enforcement Officers Memorial in Columbia. 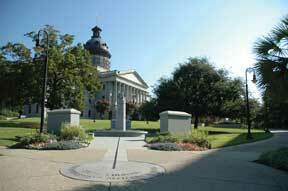 Rosanne McDowell is a freelance writer and resolution writer for the South Carolina Legislative Council in Columbia.